Your Choice In Water Heater Technology. Whether it's the installation of a brand new tank or tankless, repair of an existing tank or preventative and regular maintenance to ensure that your water heater is operating at its maximum potential, the experts at AirPlus Heating & Cooling can handle it. We are able to quickly and efficiently install a new unit in your home, should it be beyond repair. One of the primary services offered by any plumber is repairing leaky pipes. At AirPlus our plumbers are trained to identify & fix problems but also look for things that could become problems down the road. Being proactive can save you time & money. Our LeakSmart Leak Detection Systems offer peace of mind that if plumbing leaks start, you’ll be notified immediately before any major home water damage can occur. The AirPlus Plumbing Team will help all of your home's drains clog-free! Clogged Kitchen Drains: Slow running or clogged kitchen drains result from buildups of fats, soaps, food & grease. Clogged Bathroom Drains: Bathroom drains are also prone to clogging from soap buildup, hair & toothpaste. 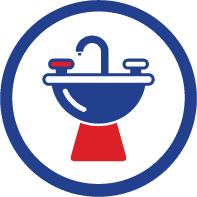 Clogged Utility Room Drains: Utility room drains get clogged with dirt & dust and often these clogs go unnoticed leading to basement floods & water damage. Clogged Sewer Drains: When sewer drains get clogged the results can be catastrophic. We can help! AirPlus now offers American Standard ActiClean® Self-Cleaning Toilets. Toilets also have lots of problems that our plumbers can fix quickly. Including problems with flushing, toilet overflows, and clogging. Sewer problems can be gross to deal with. Slow draining, unusual noises, and foul smells can all be indications that you should hire a plumber to repair your sewer lines. If you experience any of these things, you should arrange for a plumber to come to inspect your sewer to assess the situation and give you a cost estimate. Replace a Faucet or Much More! Installing a new faucet or showerhead can give your bathroom that new & luxurious feel missing in an outdated bathroom. Why not do a mini bathroom remodel with new faucets, a toilet & cool new light fixtures. And maybe add a new tankless water heater for never ending hot water. AirPlus can help you with all the plumbing and electrical for your new light fixtures too! Whether you are a home builder or a handy, DIY-er acting as your own contractor, AirPlus can help you with plumbing. Garbage disposals are great when they are properly installed, maintained and are working properly. But when there’s a problem it helps to have a professional plumber identify the problem and sole it professionally to keep your kitchen plumbing running smoothly! All throughout your home, there are sources of potential water leaks. LeakSmart senses a leak and shuts off your water main in 5 seconds or less, protecting you from devastating water damage. Sophisticated technology, simple to maintain. Peace Of Mind That Your Home Is Protected Even While You're Away. The LeakSmart system is run on the latest Zigbee 3.0 protocol enabling the system to work 24/7 even when the power and internet are down. Add a LeakSmart Detection System to Your New Water Heater Install By AirPlus and Save! Installed LeakSmart Pro Systems For Existing Water Heaters Starting At $1,000. Installed LeakSmart Pro Systems For New AirPlus Water Heater Installations Starting At $700. Add-on a LeakSmart Detection System to your residential water heater install by AirPlus for as low as $375.